Our parents are our most unexplored mystery. Whether close or distant to us, we see them as "parent," rarely knowing or thinking about the person that they are outside that role. So few of us get to discover that person inside, even if it may be just a question away. Like many, Karen grew up with a father who was always there and yet always absent. As a little girl and then an adult, she talked to him, but they never really had a conversation. 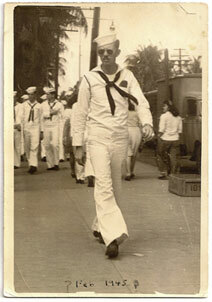 He'd told her stories of his childhood and of his time in the Navy, but she'd barely listened. But on his 81st birthday, without explanation, her father placed two weathered notebooks on her lap, with more than 400 pages of letters he'd written to his parents during World War II. The more she read, the more she discovered about the man she never knew and the secret role he played in the war. Thus began an unintended journey—one taken by a father and daughter who thought they knew each other, a journey of healing and discovery that started with a leap of faith. Book Giveaway Contest: To win a copy of Breaking the Code please enter using the Rafflecopter form at the bottom of this post. The giveaway contest closes this Friday, November 9 at 12:01 AM EST. We will announce the winner the same day in the Rafflecopter widget. Good luck! Karen Fisher-Alaniz was born and raised in Washington state. 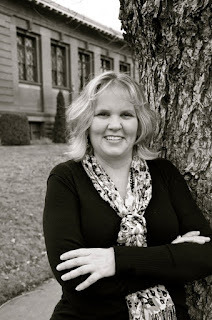 She taught special education for fourteen years before embarking on a new path as a writer. Although she'd been writing for fun since first grade, she'd never considered writing a book until her father handed her a collection of letters on his 81st birthday. Since then, she's toured bookstores and other events signing her book, inspired audiences with her public speaking, and was even interviewed by NPR's Audie Cornish for the Weekend Edition. She lives in Walla Walla, WA. WOW: Could you tell us a little bit about your writing life before Breaking the Code? Karen: I taught special education for 14 years. It’s a job I loved and a career I planned to retire from somewhere in the far off future. But health issues forced me out of my job in 2004. I was devastated. I never imagined doing anything with my life besides teaching. I floundered for a few years. It was a really low point in my life. Then I picked one of my barely-written-in journals and started to write about it. It gave me an outlet for my feelings and it gave me something to do. That experience became the foundation for a new chapter of my life. As a child I enjoyed writing for fun. In high school I entered an essay in the Guideposts Youth Writing Contest, and won a scholarship for it. And now, all these years later, the love of writing I experienced as a youth was pulling me out of my despair. I started to write about all kinds of things. I learned everything I could about writing for magazines, and started submitting. My articles were published in teen and regional magazines. My essays appeared in Chicken Soup for the Nurses Soul, and Voices of Multiple Sclerosis. The great thing about freelance writing is that you get feedback very quickly. And that feedback was good. Magazine editors complimented my writing style. But I wasn’t entirely satisfied. I wanted to try writing books. I wrote several novels and children’s books. I submitted them occasionally, and got my share of rejection letters. A couple of times, an editor or agent wrote a nice comment on the letter, but it was still a rejection. It was during this time that I had started having breakfast with my father once a week. He was suffering from what we later learned was Post-traumatic Stress Disorder (PTSD), and I wanted to help him. So, week after week, I asked questions and listened to his story. WOW: Breaking the Code actually began as a direct transcription of your father's World War II letters for your children to read. When did it occur to you that this might be a story that other people might also want to read? Karen: Yes, that’s true. He laid these notebooks on my lap, filled with 400-pages of letters I never knew he had. There was something that happened in that moment; although he didn’t want to talk about it, I had a sense that there was something more to the story. I transcribed the letters and in time, decided to write the story around the letters, just for my family. But even if it was just for my family, I still wanted it to be the best it could be. So, I joined a women’s critique group. I had belonged to the group for several months when two of the women stayed after to talk to me. One of them asked if I’d ever considered that this wasn’t just my father’s story, but that it was my story too. And truth was… I hadn’t. She went on to share an observation; that every time I came to the group, I waited until my critique was done and then I talked about how the experience of discovering my father’s secrets was affecting me. Over the next few days, I contemplated her observations. I had always thought of this as my father’s story. It seemed wrong to make it my story too. But as I thought about the journey of discovering my father through his story, I felt the story pulling together. So, I decided to test it; I wrote rewrote several chapters, adding myself into the story. Reading it in this new format, I knew it was perfect. It just felt right. WOW: How did your father react to your desire to write this book? Did you ever worry that at some point your father might say, "I've changed my mind. I don't want to tell the world this story." Karen: My father was suffering terribly from nightmares and flashbacks. I had only one goal—to help him. I knew I had to write the story first and then figure the rest out later. So, when we were together, I focused on listening to his story. He knew when I started submitting it. But he didn’t ask much about it. When I finally landed a publisher, I had a teeny, tiny thought that he might say he didn’t want other people reading about him after all. But I had also watched him change over the months that became years. He was proud of his part in the war. He was starting to share his story with friends, and even strangers at times. He had said many times that nobody would want to read an old man’s stories. Every time he told his story to someone, he saw the awe, he heard the praise, and each person had a small role in affirming his Story, his heroism during the war. So, there was a bigger part of me that felt he was ready to have his story told. WOW: Your father had kept this secret about himself for half a century. Was it difficult to get him to talk about his experiences and memories? Karen: There’s a reason the book took so long to write. My father’s memories were locked up so tightly that even he didn’t have access to them anymore. And the more traumatic the memory was, the higher the wall he built around it. I had to be patient, and let him talk when he could, and be silent when he must. My father’s story was like a puzzle whose pieces were scattered on the water. They were difficult to get to and even when you did get to them, they didn’t fit where you thought they would. But eventually, I had enough pieces to understand what he’d endured. Interviewing someone about something personal is a tightwire walk. There’s no way to know that if you follow these steps, you’ll be successful. It’s different for everyone. The key, I think, is to give the gift of time, and be consistent. Story sharing is about relationship. When you take the time to cultivate a new or different relationship, your interviewee is more likely to share. It doesn’t have to take a lot of time. For my father and I, it was an hour every Wednesday. Over the table at a local diner, we started to talk, and to listen. Sometimes we talked about the war, and sometimes we didn’t. I had to be OK with that. It was about relationship. WOW: Do you have any advice for us about drawing stories out of the people we interview? Karen: Choose a time and place that is good for both of you. You can bring a list of questions, and don’t be dismayed if the answer seems to veer off course. Sometimes those rabbit trails are rich with Story. Record what you learn in some way. You can take notes, use an audio recorder, or even video tape the interview. Take your cues from your subject. If you see a wall come up when you turn on a tape recorder, turn it off. If the wall comes up when you make notes, keep the notes to a minimum and fill in details later. Another piece of advice—be quiet. It sounds funny but part of hearing someone’s story is allowing silence. We’re not used to silence. We fill every moment with noise; TV, computer, cellphones, and music. Silence feels wrong—it feels awkward. But it’s in the silence that the mind is free to wander around finding answers. Watch the person you’re interviewing. You’ll pick up on cues they aren’t aware of. When my father was accessing a difficult memory, it was like a sheer curtain was pulled over his eyes. He was distant and sometimes looked out at the horizon outside the window. You’ll learn signals to ease off, or to be quiet, or even to change the subject. Your subject is honoring you by telling their story. Honor them by listening to every word, no matter how simple, with the attention and compassion it deserves. Honor your subject by sharing your story too. Some of the most powerful moments, the moments of connection, happen because you were able to share something personal. Mind, body, soul connects through Story. WOW: How did writing this book affect your relationship with your father? Did it change you in any way? Karen: Before this experience, I knew my father simply as Daddy. He taught me to ride a bike. He waited for me patiently outside my dance lessons. He tucked me in at night and called me, “Puddin’ Head Jones.” And now I was sitting across from an old man. He was in his 80s, walked with a cane, and yet he was telling me about transferring from ship to submarine in the middle of the ocean. He scaled the side of a ship with code breaking equipment strapped to his back, while Kamikazes blackened the sky. My father was a top secret code breaker. My father was a hero, a reluctant one, but none-the-less, a hero. Before this journey began, my father and I had a typical, raised in the 1960s relationship. We didn’t have a bad relationship, but we didn’t really know each other. My mother stayed home with the kids and my father worked for the railroad. It was a typical middle class childhood. Dad and I talked at each other, but never really had a conversation. That’s what Mom was for. But as his story unfolded, our relationship was raw. It was open. You can’t share your secrets with someone you love and not be affected. Today we are closer than ever before. We can talk about anything. The most marked difference is that when he’s had a nightmare or is bombarded with war memories, he tells me. And when it’s out in the open right away, it seems to dissipate sooner and easier. My dad is still my daddy. But he’s my hero too. WOW: What was the most difficult part of writing this story? The most rewarding? Karen: The most difficult part was that I’m a girl. Funny, but true. Let’s face it, if I have a problem, I turn to my girlfriends. Women just seem to know that talking it out will help. But men don’t think that way. I had to put that girly side of me away and approach my father his way. There were so many times that I wanted to use psychology on him and say, “Tell me all your problems. You’ll feel better. Trust me.” That would never have worked. The concept was foreign to him, and to most men probably. I had to let him take the lead. I learned to follow. Another hard part was when he read the whole manuscript for the first time. I gave it to him in sections. A memoir is so personal, and in Breaking the Code, I wrote about how I felt in situations with my father. I felt so exposed and vulnerable when he read it. One section was particularly difficult. In it, I talked candidly about his symptoms of Post-traumatic Stress Disorder. My gentle father had changed into a man I barely recognized. He took most of his anger out on my mother. I didn’t really want to write about that, but you can’t talk about PTSD honestly without discussing the ugly parts. Before he read it, I told him that if there was anything he didn’t want me to keep in, I’d take it out. I sat there as he read. I felt glued to the seat. I wanted to see his reaction and yet I didn’t want to see it. It was excruciating. When he finished, I said, “Well…What do you think?” He answered, “It’s fine.” I reminded him that I could take pieces out if he wanted me to. He shook his head and that was the end of it. I’m so in awe and proud of my dad for letting me tell the ugly truth about PTSD. It has helped a lot of people. We hear from them all the time. WOW: We always enjoy learning about how others reached their goal of publication. Could you tell us a little about the road you took to publication? Did you have an agent, a publisher, etc., how did you find your publisher, any bumps in the road? Karen: My daughter is in her 20s. She knew how badly I wanted her grandpa’s book published. She understood what it meant to me too. One night she said, “What if you did like Jim Carrey in the movie, YES MAN? What if you said, “Yes” to everything and anything that has to do with writing and your book?” It sounded silly and we laughed, imagining different scenarios. But she wasn’t joking and ultimately, I decided to take the challenge. I live my life pretty cautiously. It just seems to be ingrained in my personality; I plan, research, and contemplate every move I make. Saying, “Yes” spontaneously would be a true challenge. But I did it. Eventually, that’s exactly what lead to a book contract. I know I should have been happy about her kind words, but to be honest, I was tired. My friend was already up in the hotel room resting and watching TV. She’d called me a bit ago and said to come up and we’d order room service. It sounded so good. I sat down next to her and she grilled me on my elevator pitch. She asked me all about my father and his story. She grabbed a pencil and paper and wrote down what I should say at my next agent/editor meeting. That’s when I realized what she was doing; I felt so bad that I’d wasted her time. I informed her I’d already used up my allotted appointments. Besides, there was only one more 15-minute section left today (and for the whole conference). She immediately went to the table where I’d checked in. She knew the lady at the table who was keeping track of agent and editor appointments. Together they ran down the list, looking for openings. “No, not that one,” she said. Then she tapped the paper, “Here…this one’s good,” The woman at the table handed me a slip of paper and pointed to a door. When it was my turn, I gave my 2-minute pitch again. But this time it was different. The editor, Peter Lynch, said, “So it’s like our parents had these lives we never knew about.” They were words I’d said myself about my book. I thought, “He gets it.” It was an amazing moment. He asked me to send him the first 50-pages and I had a contract within about six weeks. Just like that. When it happens, it happens fast. So, I owe it all to my daughter, and Jim Carrey. My advice: Just Say Yes. WOW: That is an incredible story. “Just say yes.” It should be the new motto for all writers! So what's up next for you in the writing world? Still saying yes? Karen: I’m working on two books. Running in Circles is a memoir about raising a son who has Attention Deficit Hyperactivity Disorder (ADHD). It’s a humorous look at a former self-proclaimed perfect parent (me!) and the child who changed it all. The second book, also nonfiction, is about a Vietnam Veteran. Michael Reagan is a talented portrait artist. He worked hard to overcome his childhood and the trauma of war by building a life around his art. He had an artist studio that was the envy of other artists. He drew portraits of celebrities and politicians raising $10 million for charity. He was the official artist for the University of Washington. He had it all; prestige, prosperity, respect. But when a grieving widow asked him to draw the portrait of her husband, a soldier killed in Iraq, his life took a drastic turn. After receiving the portrait, the widow called Mike and he knew what he had to do. He gave it all up—his career, his job, his art studio, to devote the rest of his life to drawing portraits of fallen soldiers. He’s bringing them home, one portrait at a time. He’s an amazing man and I’m honored to be the one to tell his story. WOW: Remember Karen’s advice everyone: Just Say Yes! Learn what Jerry has to say about Karen Alaniz and her memoir about discovering her father's World War II past: Breaking the Code. Don't miss "Create a Family Tradition of Story Telling" by Karen Fisher-Alaniz who recorded her father's World War II memories in Breaking the Code. Stop by for a post about Post Traumatic Stress Disorder and a chance to win Karen Alaniz's memoir about her father's World War II experiences: Breaking the Code. 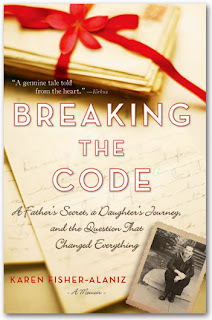 Don't miss the review for Breaking the Code -- the memoir of Karen Alaniz's journey to forge a relationship with her dad and the incredible tale of his World War II service. Start off Reading with My Guy Week at Words by Webb -- a week of books guys and gals would love to read together -- with Breaking the Code, a memoir by Karen Alaniz. Stop by for a virtual chat with writer Karen Alaniz, author of the memoir Breaking the Code. Bring your questions! Don't miss a review of Karen Alaniz's Breaking the Code by a blogger who loves all things military! Stop by to learn more about Karen Alaniz, her father and their memoir Breaking the Code. You can also win a copy today! Karen Alaniz, author of Breaking the Code finds herself on the hot seat today. Stop by to find out what she has to say and enter to win a copy of the double memoir she shares with her father. To view all our touring authors, check out WOW's Events Calendar. Keep up with blog stops and giveaways in real time by following us on Twitter @WOWBlogTour. Book Giveaway Contest: Enter to win a copy of Breaking the Code! Just fill out the Rafflecopter form below. We will announce the winner in the Rafflecopter widget this Friday, November 9. I love history, and this book sounds fascinating. WOW! Thanks for sharing your story, and good luck with the blog tour and book. I agree, this sounds like a book right up my alley. Thanks for bringing it to our attention and thank you, Karen, for sharing your success with us. Great interview. Karen, thank you for sharing your writing process. After you collected all the stories from your father, how did you decide where to start the book? Did you outline? This sounds fascinating and it's too true that we often don't think of our parents beyond their roles as our parents. An amazing story and great interview! Thank you! I'm picking up a copy of your book. I'm also interested in the topic of your forthcoming book about the portrait artist. What a unique story! This is inspirational, especially as someone with a military dad. I wish you the best on your blog tour! Dawn- You're welcome! It's my pleasure to be here - I love being in the company of women. Angela - I haven't actually shared the "Yes" story very much. I thought it sounded too cheesy. I'm glad it came through the way I wanted it to. Women are busy - we probably say yes to far too many things that we shouldn't - out of obligation, wanting acceptance, or whatever. But a focused and intentional "Yes" like this can be life-changing. MP - Thank you. We have amazing Dads! I love the whole story behind the book. Your conversations with your father. Wow. And I like the title. Its very attractive. Congrats Karen. Diane - Thank you. I hope you enjoy it! Would you like pepperoni with that manuscript?